Coolhunter brings us mouthwatering images of La Pâtisserie des Rêves, a Parisian bakery which displays their tantalizing wares in gallery form throughout the store. So it’s not really a bakery per se–it’s a pastry boutique, and the presentation suggests true artistry. 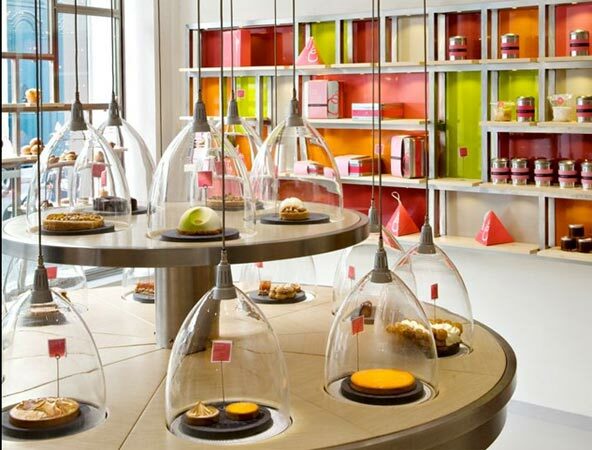 The best ideas are those that solve business, branding, and audience problems simultaneously, and this execution would definitely qualify: from a branding perspective, the unique presentation is a differentiator amongst the myriad bakeries dotting Paris; from a business perspective, it moves traffic more efficiently through the store and speeds transactions, relieving congestion at the counter where throngs of customers would normally mob the bakery case; and from an audience perspective, it allows patrons to unhurriedly peruse the merchandise in a playful atmosphere that elevates the various trifles from mundane commodities to little works of art, infusing pastry purchase with a sense of occasion. It’s cool when businesses seize fresh ideas by conceiving of themselves as another type of business, a business in some other industry or category. For example, in some ways, Mini is a car company that behaves like a toy company; Virgin Air is an airline company that behaves like an entertainment company–obviously in part because the larger Virgin brand informs how they approach their airline business, but still. This particular instance isn’t anything drastic or revolutionary, but it’s an example of how we can revitalize ourselves and learn from other disparate industries, businesses, and brands by retooling the way we think of our own, and by being open to the idea that our “best practices” may not really be the best practices. For his new project, bADimal, the astute Anthony Kondeati presents a new series of advertising trend, case study, and campaign analysis videos that cut through the noise to cull the larger insights we can draw from media arts successes and failures. These thoughtful videos, which go up each Wednesday, provide depth on branding topics and give systematic, holistic consideration to brands themselves, as in last week’s analysis of the Coke vs Pepsi authenticity brand-off. This week’s video is on the branding implications of automated services. Have you ever felt like companies bury the information on how to talk to a real person? Guess what? They do. In calculated decisions made on the daily, companies often opt for automation of key customer care touchpoints at the expense of relationship-building. In these instances, automation or self-service is often a cost-cutting brushoff presented to customers in the guise of convenience, but we all know they can sometimes be anything but. Businesses must realize that not all branding goals can be measured in terms of traditional ROI metrics–if your aim is relationship-building, measure customer interaction, satisfaction, repeat business, and brand evangelism. 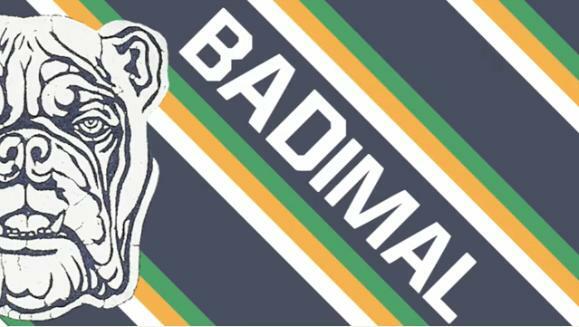 Head over to the bADimal channel on Vimeo for the first two videos in the series, and tune in each Wednesday for more! JWT for Kit Kat is on fire–but this time it’s Auckland, not Tokyo. In their latest, passersby in local parks are invited to take a break twice over–that is, break up a poster to take a break. The confectioner placed wooden posters at park entrances and in public spaces–posters that could be popped apart and assembled into the perfect bench for a (snack) break. (And it’s got to be intentional that the mode of assembly so closely parallels the way you would snap apart a Kit Kat bar–it’s too good not to be.) 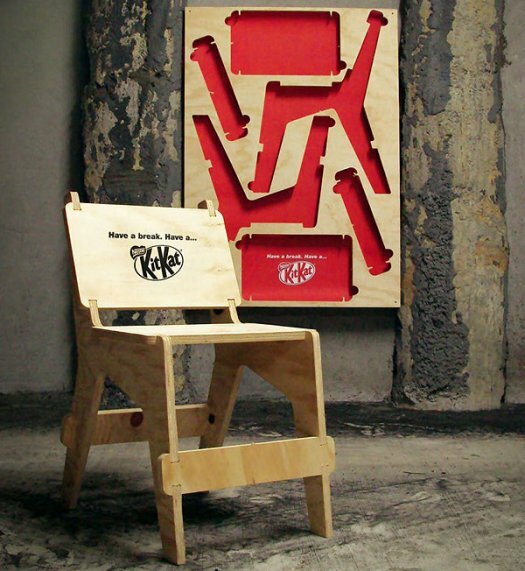 The poster is not only interactive–it’s useful–and it does a kindness while connecting simple pleasures with the “break” line Kit Kat’s been using for years. 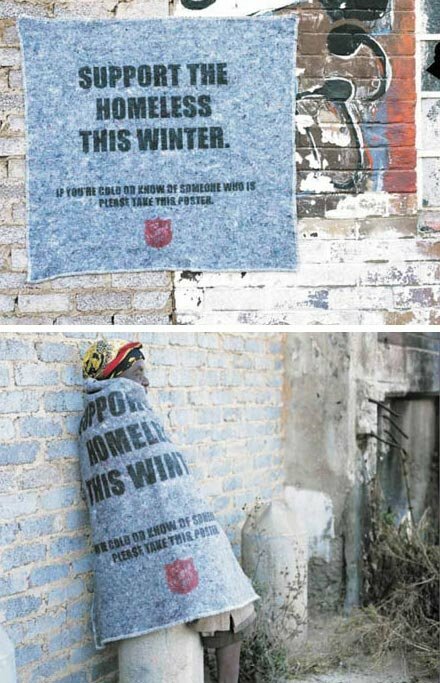 In the spirit of useful interactive posters, here’s one of my all-time favorites, from the Salvation Army, which posted blankets emblazoned with the words “Support the homeless this winter. If you’re cold or know of someone who is, please take this poster” in areas of need. Not only did these ads get the word out and even provide much-needed comfort to the homeless that began using them for warmth, but when the blankets were thus displayed, on the backs of those in need, the message became all the more starkly powerful. The absolute opposite of urban spam. Urging true creativity over cut-and-paste, FITC, which puts on design and technology events, is encouraging old-school agencies to become nimbler and more inventive with their digital work–before it’s too late. In a video to promote their upcoming digital conferences, FITC creates a Discovery Channel Pompeii Special of sorts chronicling the fall of the “Last Advertising Agency on Earth.” It’s funny, and I’m sure it hits close to home for many branding professionals who have lived through just the sort of dysfunctional head-in-the-sand environment the video describes, but it seems a bit of a harsh indictment to me–I’m unwilling to believe that no big agency has learned how to embrace new media (at least on a case-by-case basis) this late in the online game (seriously, guys–partying like it’s 1999, are you?). But there may be a kernel of truth under the heaps of tardy exaggeration–for every gem of inspired digital, there’s a truckload of unimaginative nonsense, and it’s perhaps less about digital per se and more about combating a culture of complacency: it’s about knowing how best to play the game in new and ever-changing spaces, whatever and wherever they may be. Best Week Ever has collected 50 of ambient’s stodgiest sons (that’s billboards, to those of you not chuckling at your own jokes) for a showcase of “50 Awesomely Elaborate Billboards”–translation: Media Arts City. I’ve got almost undue love for a good ambient execution. (That and packaging; I can’t help it.) So while I’ve seen most of these before over the years (and have even posted a couple here on the site), you might not have, and I think you’ll love them. 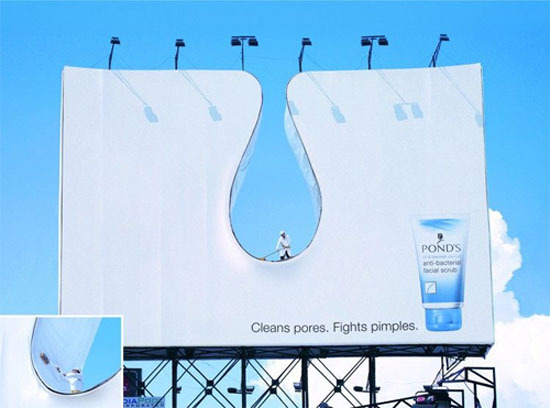 These billboards demonstrate that no medium is dead or dying or dull or limited, so long as inspired insights meet inspired creative. The list is missing many of the greats (Mini chief among them–the one they picked was basic by Mini standards. Unconscionable–I will have to fix this. Look out for a facemelting Mini post soon.) but check it out nonetheless–a nice survey of billboards that play with (and even transcend) their format to do it right. Happy St Patrick’s Day! 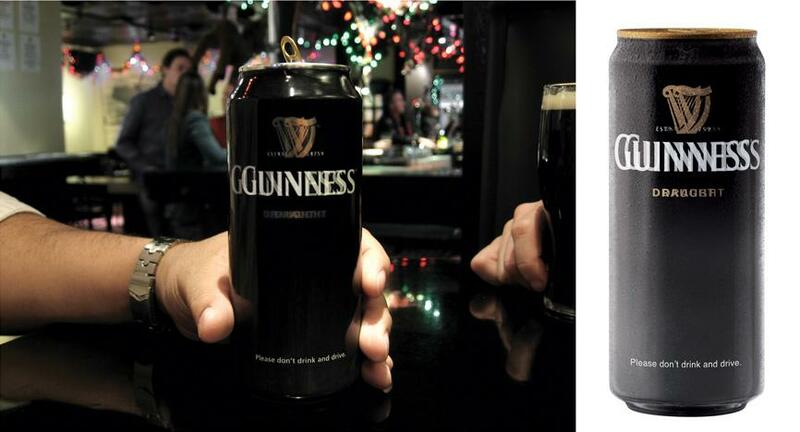 In celebration, AdFreak brings us a cheeky-but-upstanding execution by St Pat’s staple, Guinness. In a 2007 effort by BBDO Toronto, the Irish brewers sent bars and pubs cans featuring blurry logo and type, each imprinted with a gentle reminder: “Please don’t drink and drive.” A clever, attention-getting call to responsibility in service of their “Enjoy Responsibly” campaign. In the wake of Citizens United v FEC, the harebrained January Supreme Court decision that gave corporations to right to make direct political campaign contributions as an extension of free speech (and in so doing insidiously and ominously granted corporations legal “personhood”), liberal-leaning political PR firm Murray Hill is running for Congress in Maryland’s 8th district. This astute campaign may be hilariously absurd and tongue-in-cheek, but underneath it all it’s bitter—and deadly serious. The campaign deftly exposes the mockery the Court’s decision makes of the political process and an independent government, and the real dangers it ultimately exposes us to as a free people. 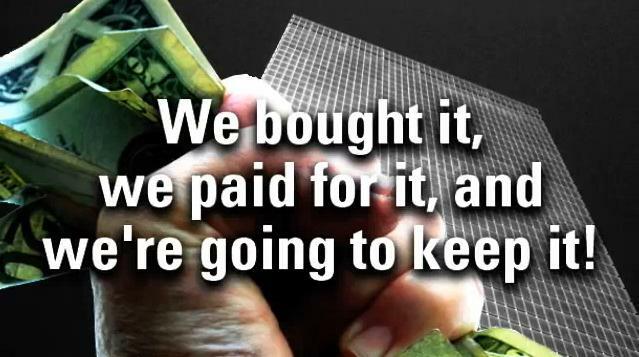 What’s truly tragicomic is that in campaigning to be an elected legislative representative, Murray Hill still fails at being evil–if elected, they would, after all, be using more legitimate means of influencing policy than most corporations do today. This campaign may be the best agency ad in recent memory: it amps their cred as a go-to firm for lefty causes (they have a long history representing labor unions and environmental organizations), and shows that as a PR firm, Murray Hill knows how to run riot in the PR game.